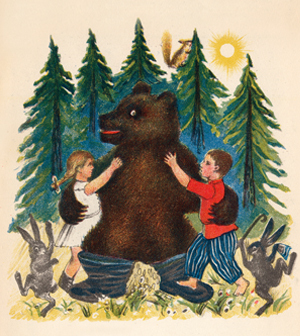 The art of Soviet-era children's literature shifted from experimental and avant-garde to a realistic, government-mandated style under Stalin. In Kornei Chukovskii’s children’s book Kradenoe solntse (Stolen Sun, 1936), a Stalinesque bear saves the collective from darkness, according to a Special Collections exhibit, by defeating the selfish alligator who has swallowed the sun. View a slide show of images from the exhibit. In the 1932 edition of the Soviet-era children’s book Kem byt’? (Whom shall I become? ), one professional option—an engineer—is depicted as an abstract, mustachioed man, holding a blueprint and a drawing of a building. On the opposite page is a fully constructed building that looks, as associate professor of Slavic languages and literatures Robert Bird puts it, almost Frank Gehry–like. By the mid-1930s, the illustrations had changed to the Soviet realist style, which was mandated by Stalin and easily interpretable, meant to be comforting to a population recovering from “rapid modernization, forced collectivization, and mass purges,” writes art-history professor Matthew Jesse Jackson in an online essay accompanying the exhibit. Soviet realism was presented as more mature than the avant-garde style, says Bird, showing a more certain future. With the new 2,384-square-foot space, “we hope the gallery doesn’t look the same from one show to the next,” Schreyer says. Every case is on casters and can be configured to “best serve the needs of the types of materials in the cases.” Some images from Adventures in the Soviet Imaginary are reprinted on cards and hung from the ceiling, and the 36-foot-long case along the back wall holds posters from Special Collections' Harry Bakwin and Ruth Morris Bakwin Soviet Posters Collection. Bird and his students have organized the exhibit by themes: modeling and mapping, viewing and reading, and international communism, for example. To decide the themes, Bird worked with eight graduate students in history, Slavic languages and literatures, and art history. The group also included art-history professor Jackson and Claire Saperstein, AB’10, who won a 2010 Fulbright to study history in Russia. Each contributor wrote essays for the web exhibit and for the print catalog, distributed by the University of Chicago Press. Books such as Volodia Ermakov and Kem byt’? are “inherently pedagogical,” Goldman says. They teach values to children, whether it's how to be a hero or showing the child that he can choose his own future within certain societal constraints.